Ford Skip Loaders are a favorite for many famers and homeowners looking for a more affordable option that still can pick up heavy loads and drag a good amount of dirt. Although they are no longer made Ford Skip Loader’s are still great machines. If you have a Ford Skip Loader or are looking at purchasing one and need a new set of tires look no further than Monster Tires impressive selection of low priced Ford Skip Loader Tires. Contact the friendly staff here at Monster Tires today to find out more about what we have to offer. When your Ford Skip Loader Tires wear out, your equipment becomes difficult to use and even unsafe to have on a work site. The tires are the part of heavy equipment that takes the biggest beating, and it is absolutely essential that you keep them well maintained and replace them when they wear out. At Monster Tires, we have high quality construction tires for Ford Skip Loader. We stock 445 – 545 Skip Loader Tires. If you need Construction Tread Tires for Ford Skip Loader, we have them for you here at Monster Tires! Heavy Equipment Tires – Affordable and Dependable! Your Ford Skip Loader is only as trusty as the tires it runs on. When you have good, durable, heavy duty tires, your equipment can handle difficult terrain and adverse working conditions. When your tires are worn out, your equipment is unsafe to drive. You never know when an accident might happen. That is why you need affordable, dependable Off the Road Tires for Ford Skip Loader, so you can get back to work! 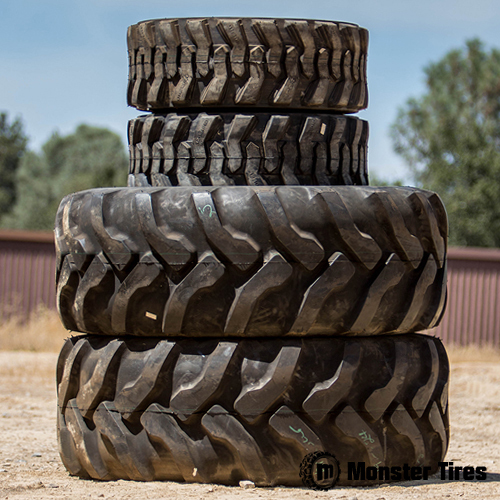 At Monster Tires, we have Heavy Equipment Tires to get your piece of equipment rolling again. Trust in Monster Tires for your next set of Ford Skip Loader Tires!